A new study has revealed just how much more effective climate sceptics are at commenting on forums, posting stock arguments, and linking back to sceptic sites. A fascinating new study commissioned by Oxfam and produced by digital mapping agency Profero has shed new insights into the way climate sceptics’ networks operate. The study’s conclusions, as yet unpublished but seen by Left Foot Forward, were presented to a closed meeting of campaigners on Wednesday night. Profero’s study analysed online coverage of the “Climategate” debacle that broke last November, tracking its progress from fringe blogs to mainstream media outlets over the ensuing weeks and months. • The speed of information flow within the sceptic community, with its rapid publication of sceptical “research”, is far quicker than any scientist or NGO could hope to match – and handily unencumbered by peer review or sign-off processes. This meant that because almost no-one from the climate movement responded to or rebutted the sceptics’ arguments, they ended up owning the story. This allowed them to shift what political theorists call the “Overton Window”: the acceptable parameters within which a debate can be conducted. Suddenly after Climategate, it became acceptable for the mainstream media to question the fundamentals of climate science. As cognitive linguist George Lakoff has written, if you don’t contol the way an issue is framed, you don’t control the debate. Climate progressives allowed this episode to be written on the sceptics’ terms. The result? A sizeable drop in the public’s belief in climate change (although the freezing winter may also have played a part in this). Profero’s study then looked at the character of the online climate sceptic networks that permitted this information flow. 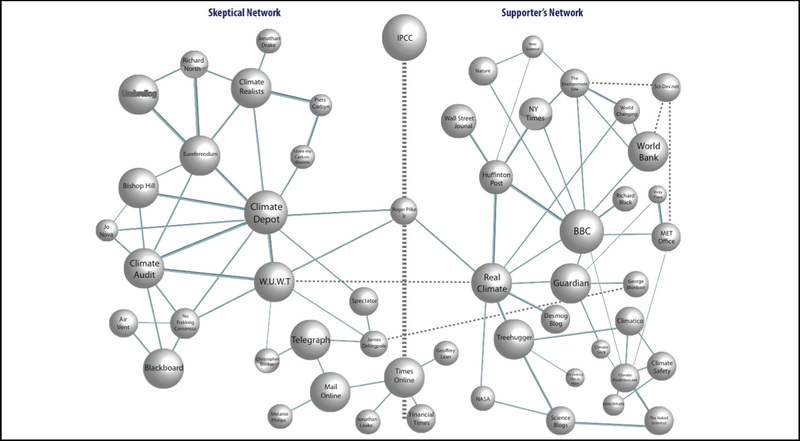 It discovered that the sceptic community is extraordinarily well-networked and interwoven, with sites like Climate Audit and Climate Depot acting as hubs for a wide range of other individual pundits and bloggers. (And no, I’m not going to give these sites free publicity by linking to them.) Of the top five most linked-to climate commentators, four are climate sceptics. The one exception was Guardian columnist George Monbiot, who was also the only significant voice countering the sceptics during the whole Climategate debacle. “I have seldom felt so alone,” he wrote early on in the scandal, with justification – Oxfam’s study shows that almost no-one bothered to back him up in defending the integrity of the science. In many ways, the tactics revealed by Profero are not new. They were first tried and tested by American neo-cons in the 1970s long before the internet became a tool for campaigning. What is new is that the patterns of activity are now traceable, which means that the progressive response to climate scepticism can be more strategic – that is, if we listen to the findings. Indeed, the reports’ insights should give pause for thought to progressives contemplating the strength of their own networks. Stuart Conway, the study’s co-author, declared simply that “there are no progressive networks” – just hubs of activity here and there, lacking interconnection. Whilst a number of blogs buck this trend – honourable mentions include Treehugger and, yes, Left Foot Forward – the pro-environmental community as a whole lacks brio and responsiveness. It’s not that there we don’t have the numbers: it’s more than we’re not using our numbers effectively. NGOs, notably, were nowhere to be seen during the debate. Whilst there were some good reasons for this – NGOs feared they would be simply seen as “the usual suspects” in rebutting deniers – this clearly left a vacuum that needed filling by an activist community. For now, though, let me close with a challenge for progressive readers: one of the study’s more obvious conclusions was how effective climate sceptics are at commenting on forums, posting stock arguments, and linking back to sceptic sites. This is unsurprising for anyone who has ever trawled through comments left behind after any climate change article. By the time you read this, there will doubtless be sceptical comments posted beneath this blog, too. • Refer to the discussions at RealClimate and Climate Safety. Oh, and remember to check out James Delingpole’s column at the Telegraph. If any of it makes you angry, you might like to let him know. Did I say be polite? Scratch that. “We’re really excited that people are taking an interest in what we do and hats off to LeftFootForward for getting the scoop on this piece of work but we’d like to clarify what’s being discussed (most of the conversations focus upon a visual representation of some of the key conversations in the form of a landscape map) as it should be understood in the context of an entire report (120 pages or so) which hasn’t been made public.